We (Guante & Big Cats, plus Chastity Brown, plus our band featuring members of Dragons Power Up!) will be taping for 89.3 The Current's Local Show on Monday; it should air next Sunday the 7th at 6pm. Awesome. ~MPLS TV fundraiser on Thursday, 1/28 at the Bedlam Theater; they're a local video crew who does some very cool stuff. The show is packed with "buzzing" bands like Zoo Animal, Lucy Michelle, the Paragraphs and many more. Starts at 6; music at 8; we're on around 10. It's $10 and should be a lot of fun. ~Beat Coffee House on Saturday, 1/30 w/ our friends The Gavels and a few other bands. This one starts at 6pm and is ALL AGES. We're the token hip hop act at both shows, which is always fun. We'll also have copies of AN UNWELCOME GUEST for sale! 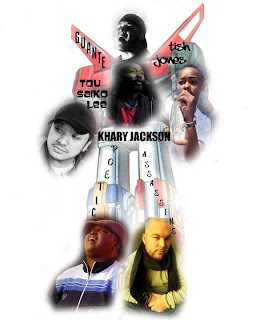 ALSO, an early update on a really exciting show: February 6 at Intermedia Arts: Guante, Khary Jackson, Tish Jones, Tou Saiko Lee and the Poetic Assassins unite to form POETRON. Haha. Kind of a silly name (and a ridiculous image courtesy of Hieu Nguyen), but this really will be a showcase of some of the best spoken-word in the Twin Cities-- lots of new stuff, surprises and more. We all won the VERVE spoken-word grant last year and this will be a showcase of what we did with it. 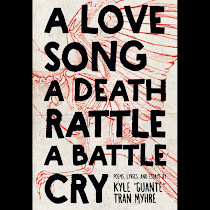 I'll also be performing solo at the Loft Literary Center on February 10 for a fundraiser to send some great local writers of color to the big AWP conference. Even more of the TC's best spoken-word will be featured there, including Robert Karimi, Marcie Rendon, Brittany Delaney, Bao Phi, Diego Vazquez and Tatiana Ormaza. 8pm.